Bic Customizable Non-Adhesive 3" X 6" Scratch Pad is made from paper. 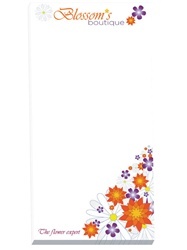 Personalized 3" X 6" Scratch Pad comes with eye-catching FREE phantom imprint. Item size: 3" x 6"
Bic Customizable Non-Adhesive 3" X 6" Scratch Pad is available with flood-coat choice.